We’re about to get our usual “tsunami” of leaf peepers here in Central Vermont (and that’s a good thing for us all…very good!). One of the most rewarding residuals for me during this time is the interesting folks from all over the world that I get to talk to. And that process has already started, let’s just call it “pre-peep”. 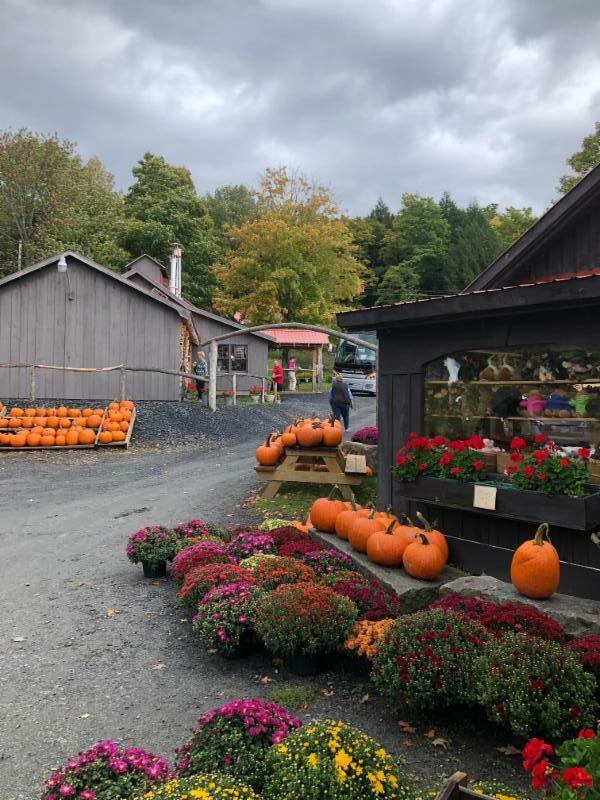 Life on the farm in the fall…notice how Burr’s wife, Betsy arranged the flowers and Burr’s son, Tommy with his pumpkin displays make it all come together so beautifully! The other day I had a California couple in the sugarhouse who knew nothing about the process. As I broke it all down for them, telling them of the forty to one sap to syrup ratio and that our trees are all wild, a single man appeared up back. He seemed quite aloof for a time but a look of total understanding appeared on his face when I got to the part where maple sugaring is grueling work. “Yaw”, he suddenly chimed in, making his Wisconsin roots as clear as if “Best Cheese” were stamped on his forehead, and proceeded to tell of sugaring the way it was when he was a kid. I might add, he was so proud of his Wisconsin heritage that my Vermont was suddenly taking a backseat. He held up his left hand, palm out; “Everyone with a left hand has a Wisconsin” he said in his nasally tone, pointing to his thumb which represented the Door Peninsula. He then proceeded to the mid section of his third finger, the maple region where they bank on the brilliant autumn foliage just like Vermont and where he grew up. Finally he grasped his pinky…”Out here”, he went on, “it’s totally different country…out here they have the festival of brown”. On another occasion I was talking to a group from the United Kingdom. One huge man in the group had flame red hair and a ruddy completion…I suspected he was a Scotchman and the second he opened his mouth, I knew he was. He spoke with a brogue as deep as Loch Lomond and when he pronounced my name, Burr, the R’s rolled out at about 6.7 on the Richter Scale. As always, I included a few little Vermont witticisms in their sugarhouse talk which drew the intended laughter; the Scotsman led the pack. Deep belly rolls erupted from his considerable girth and all of a sudden he blurted out, tears dropping from his eyes “Yer bum’s oot th’ windae Laddy!”. When things settled down and I asked for a simple translation, I learned that his words meant “you’re talking rubbish!”, and I say, “here, here…’rubbish’ was my intent”. After all, if we can’t have a little fun in life, why bother? Yes, meeting fun folks from all over the world is the best part of my job here in pre-peep Vermont. Soon our seasonal change of attitude will open up the flood gates of visitors, so to speak. From Lake Champlain to the Connecticut River and the Massachusetts border to the 45th parallel, Autumn brilliance will rule our tiny state. And oh, one more thing about this Vermont…we don’t have a place on our hand for the “Festival of Brown’.